Aberdeen boss Derek McInnes told BBC Scotland he was "bitterly disappointed" with his team's home performances. ""There was no shortage of effort but there was a lack of aggression, a lack of confidence and a lack of responsibility, because we had enough chances to win the game despite losing two goals," he said. "Clearly we expect far more of ourselves and I can only apologize to the supporters for the level of performance. We have to make sure we are competitive all of the time, not just in some of the games. "The more aggressive team won the game,the team that looked as if the points were more important to them." More from a less than happy Rangers manager, Steven Gerrard. "It's difficult to criticise the players because they've got another strong, comfortable win and a clean sheet," he tells Rangers TV. "A lot of positives there, but I've just said to them at the end of the game - don't put me or the supporters through that again because you've got a responsibility to keep entertaining right until the final whistle. We just weren't Rangers in the second half. "The job I asked the players to do, they did it in the first 30 minutes and I would take that every week. "But we're here to watch good football and a good team and the sign of a good team is when they take the scoreline out of the equation and the standards remain high." Hibs manager Paul Heckingbottom praised Marc McNulty after he scored his sixth goal in four games. McNulty scored from the penalty spot, before adding a second with six minutes to go. He told BBC Scotland: "It was a good penalty, a good goal, after a bit of a farce and gamesmanship - trying to slow it down and put him under pressure. But he's cool enough in those situations. "Even though we had 10 men we still encouraged the boys to play and we wanted to keep two strikers on the pitch as we felt we could get a winner." Rangers manager Steven Gerrard is not a completely happy man despite his side's 4-0 demolition of Dundee. "I thought the first 25-30 minutes, we were excellent - I love that hunger, intensity and the way we were hunting the ball down," he tells Rangers TV. "We played some really nice stuff and showed what a quality team we can be. "We get to half-time very comfortable and I asked the players for the same standards, the same energy and the same quality and it just wasn't there. "I didn't really recognise us in the second half, individually or collectively. I was disappointed and then Jermain Defoe made me feel a little bit better at the very end." Celtic captain Scott Brown tells Sportsound: "It was a good performance throughout. "The team spirit is extremely good at the moment but we have to keep going and not concede goals. "Tonight was a huge game for us but it was sad to see a manager of that class leave. The gaffer’s come in and it's great to see him back at the club. "For us it’s about continuing and making sure were getting better and better. Everyone wanted Lennon to come back in. He puts a lot of faith in his players so we’ll try to be as positive [in spite of] a huge loss and a huge gain. Hamilton Accies boss Brian Rice told Sportsound: "I’m very happy with our performance and delighted to give the small band of supporter who came up tonight to give them something to cheer about after Sunday. We played well and looked a goal threat. I’m delighted with the boys who are talking my ideas on board. We’ll have good days and bad days. It’s like any other team - it’s on the day. "Can we keep re-producing. We’re into 10th position tonight we’ve a local derby against Motherwell to prepare for . We hope this is a springboard to push us on. We’ll enjoy tonight and get back to work tomorrow." St Johnstone manager Tommy Wright said Hibs striker Florian Kamberi had conned referee Gavin Duncan. The Swiss striker won his side a penalty in the second half. Wright told BBC Scotland: "I thought we dominated the whole game. When it's 11 v 11 I don't think Cammy's [Bell] had a save to make. "I feel sorry for referees when players are prepared to go to ground that easy, as if they've been hit by a 40-foot truck. I went to see him [the referee] and he thought there was more contact than there was. When he sees it back he'll know that he's basically been conned. "It's not a penalty, I felt we should have had a penalty in the first half for hand ball. "We've played well but somehow we've managed to lose the game. "I can't blame the referee. The blame lies with one person, and he's won his team a penalty." Celtic manager Neil Lennon: "It was a great feeling, a great moment and a nice way to win the game. "We made hard work of it. We made it a lot more uncomfortable than it should've been. It was a sloppy goal to give away. Against 10 men, you've got good control of the game but our final ball, at times, was poor. "But that happens sometimes when teams sit in and make life difficult for you. "That was joy, relief and I was so nervous before the game. It means a lot." Hearts manager Craig Levein told BBC Sportsound: "Celtic are a good team and you can never count your chickens. I thought we were just about over the line but a cross was the one thing I didn’t expect us to lose a goal from. "I've no complaints about the red card. It is what it is but he’ll need to learn. It’s the only way he’s going to learn. Losing Steven Naismith is never an easy thing to cope with but the lads knuckled down and inspired our supporters.I'm really disappointed especially for the supporters that we didn’t get a point." Quote Message: The 36 fans who travelled up to Pittodrie are sent home with a smile on their face. This was a performance of Accies’ skill and work rate. They got the two goals and held out to get an unexpected but well deserved result. The 36 fans who travelled up to Pittodrie are sent home with a smile on their face. This was a performance of Accies’ skill and work rate. They got the two goals and held out to get an unexpected but well deserved result. Accies have been brilliant tonight, a night to remember for them, a night to forget for Aberdeen as the boos ring out around Pittodrie. Rangers stay eight points behind leaders Celtic, but it is another emphatic win for Steven Gerrard's side. They have now scored 14 in their last three matches - and this was the fourth time in a row they have fired four past Dundee at Ibrox. Glen Kamara's fourth-minute goal against his former club and further strikes from James Tavernier and Alfredo Morelos killed the game by the 23rd minute. Jermain Defoe's late strike was icing on the cake as Dundee slip back down to second bottom after Hamilton's surprise win in Aberdeen. St Johnstone throw everything at Hibs late on, and Ofir Marciano gets down low to deny Chris Kane from close range. What an ending to a pulsating encounter at Tynecastle. 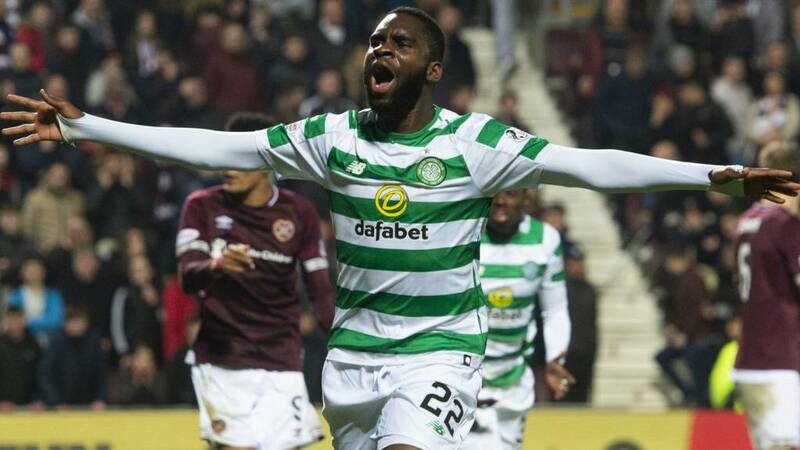 Celtic net a late, late winner through substitute Odsonne Edouard to ensure a winning start for Neil Lennon on the first game of his second spell in charge.